DUBAI (Reuters) - Iran's Oil Minister Bijan Zanganeh has dismissed as "nonsense" claims by the Saudi crown prince that Saudi Arabia can replace sanctions-hit Iranian oil in the market. "(Mohammed) bin Salman's remarks and such bragging can only satisfy (U.S. President Donald) Trump. No one else will believe him. Iran's oil cannot be replaced by Saudi Arabia nor any other country," Zanganeh was quoted as saying on his ministry's website. Washington is pushing allies to cut imports of Iranian oil to zero and will impose a new round of sanctions on Iranian oil sales in November. But Iran, OPEC’s third-largest producer, has repeatedly said that its oil exports cannot be reduced to zero because of high demand levels in the market and has blamed Trump for an oil price rally caused by imposing sanctions on Tehran. "The price hike in the market is the best evidence to state that ... the market faces a supply shortage and it is worried," Zanganeh said. Zanganeh accused Tehran's regional rival Saudi Arabia of bowing to U.S. pressure, saying such remarks had no "real impact on the market" but were part of a psychological war launched against Iran. "Any country that makes such claims ... just wants to display its support for the U.S. sanctions against Iran," Zanganeh was quoted as saying. 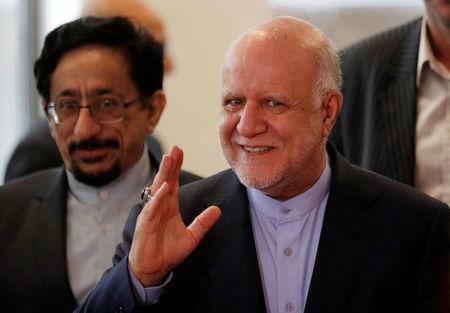 "What the Saudis had been supplying the market with, were not from Riyadh's spare capacity but from tapping its oil stocks," Zanganeh said, according to the website. A U.S. government official said on Friday that the administration was considering waivers on Iran's oil sanctions. Oil dropped to around $83 a barrel on Monday.